Notarizing a foreign language document is NOT ILLEGAL. However, CAUTION should be used as the notary is dependent upon the signer to explain the contents. You may want to find a notary who speaks the language. Most large cities have ethnic neighborhoods where bilingual notaries can be found. The face of a diploma should not be altered by the registrar or notary. The registrar or other authority of the school must sigh a statement, which is typed on the BACK of the diploma or transcript. The wording in this statement says that the diploma or transcript is either the original record issued by the school or a copy of the original document issued by the school and the date it was issued. The signature of the school official is witnessed by a notary public. 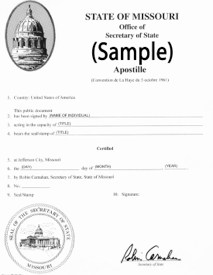 The notary states that he/she saw the school official sign the document.